Monolith Leather Look Expandable Attache Case PVC Black 2350 Pack of 1 Monolith Expanding Attach? Case. 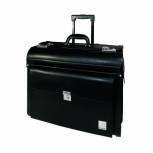 Expandable case manufactured from PVC with flock lining and gilt combination locks and fittings. Other features include full lid organiser section and raised stitch design to the top. Size: W440xD100x310mm. Black. 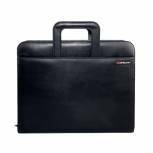 Monolith Microfibre Soft Sided Briefcase Black 3192 Pack of 1 Monolith Expandable Flapover Briefcase. 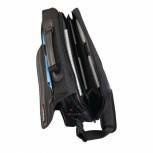 Microfibre soft-sided case with multi-use zipped and open pockets, a large central compartment, mobile phone holder, comprehensive organiser section and detachable shoulder strap. W410xD60xH320mm. Colour - Black. 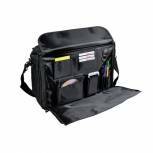 Monolith Expandable Briefcase Black 2933 Pack of 1 Expandable Brief Case with front flap over and zip pocket, quick release clasps, detachable shoulder straps, large zipped and open main compartments with an expandable base, extensive organiser under flap-and gunmetal fittings. Colour - Black. Monolith Polycanvas Pilot Case Black 2168 Pack of 1 Monolith Soft-Sided Polycanvas Pilots Case. Full width zipped front workstation/organiser section. Removable internal divider. Detachable shoulder strap. Two internal pockets and rear zipped compartment. W480 x D200 x H330mm. 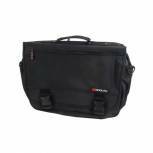 Exacompta Exactive Exatravel Multipurpose Case Polypropylene Black 55734E Pack of 1 Exacompta Exatravel Multi-Purpose Case Polypropylene. Black. 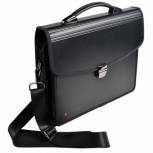 Made of strong 2 mm PP, this briefcase has one compartment for a laptop, one compartment for filing documents and numerous pockets. Designed for 13-15 laptops and A4 documents. 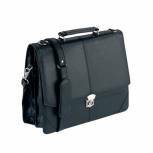 Falcon Synthetic Leather Flapover Briefcase Black 2584 Pack of 1 Falcon Synthetic Leather Flapover Briefcase. Two large main compartments. Organiser section. Zipped and open pocket under the front flap. Rear zipped compartment. Carry handle. Detachable shoulder strap. Three position lock. Size: W405 x D140 x H310mm. 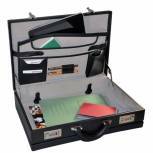 Monolith Executive Leather Look Pilot Case PVC Black 2170 Pack of 1 Leather-look pilot case with gun metal fittings. Durable mouldings increase strength. Combination locks keep your possessions safe. Fully padded laptop section prevents from knocks and bumps. Expanding filing section at the front. Handy side pockets. 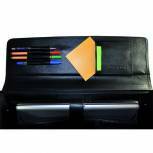 Monolith Leather Look Rolling Pilot Case PVC Black 2179 Pack of 1 Data/Catalogue wheelie pilot case with fixed base wheels and retractable handle. Front and side pockets. Combination locks. Black. 480x360x230mm.